Named for the Archangel, Raphael, patron saint of travelers. His deep voice and vigilance encourages predators to "travel on"
"Raffie" is from a long line of working guardian dogs and the nephew of our original guardian, Sabir's Michael. 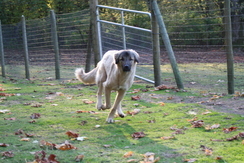 In May of 2010, when he was 12 weeks old, we drove to California to pick Raffie up from Lost Armadillo Ranch, a long time Anatolian breeder. He is from a long line of working dogs and is AKC registered. He now weighs 130#, is lithe and sinewy. "Raffie" is still very energetic and lives in the males' pasture.